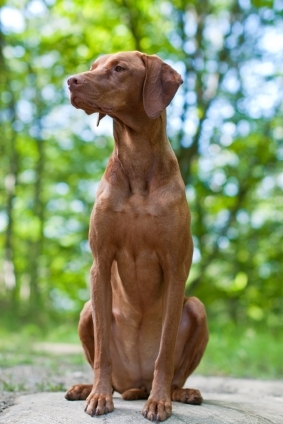 The Hungarian Vizsla is a medium to large Gundog. He has good stamina and is capable of working in all weathers – good at tracking, pointing and retrieving. He is a lively and intelligent dog whose natural skills and energy will need to be channelled into activities such as obedience training. He needs an owner who is energetic, firm and experienced at handling. Careful exercise up to 12 months is recommended as over exercicse can lead to joint problems in this long legged breed. Ideally, free running should not be allowed up to five months. 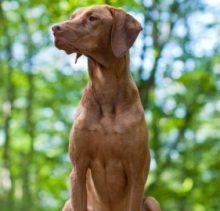 The Vizsla breed club recommend 7.5 minutes exercise per month of age. Ideally he should live in a house with a garden, preferably adjacent to the open countryside. When mature he will need plenty of exercise every day. He has a short, coarse coat which is relatively easy to care for. Gastric dilatation volvulus (GDV) (Bloat/torsion) Common in deep chested breeds.